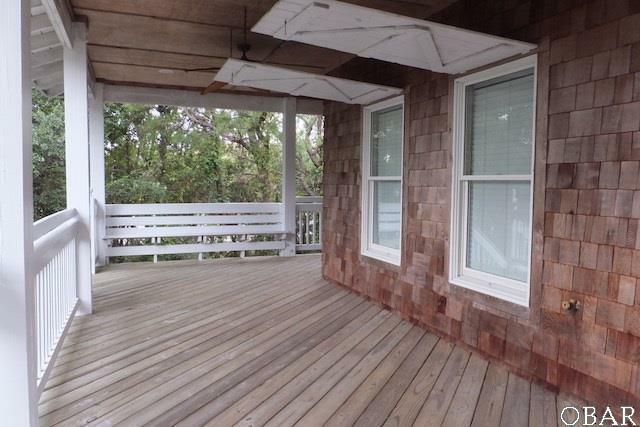 This custom built home with a live oak canopy was one of the original model homes for Old Nags Head Place. When you arrive at the property the aggregate driveway catches your attention and leads you to the covered parking area with finished ceiling, recessed lighting and a large outside shower. 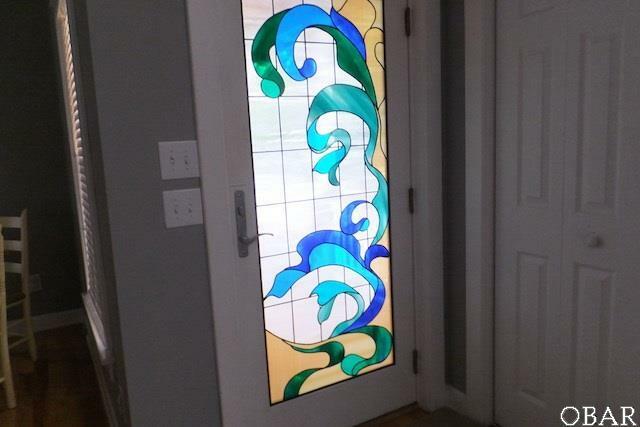 The interior and exterior finishing touches are top grade from the Nags Head style home with wooden hurricane shutters, cottage style woodwork, transoms and stain glass front entry doors. As you enter, you immediately notice the bamboo flooring, the sea-foam green soft leather sofas, the finished millwork around all the doors and windows, wainscoting, a gas fireplace surrounded by bookshelves and glass front cabinetry plus a built-in cushioned bench seat for relaxation. The living area is open to the dining and kitchen areas. The beautiful cabinetry continues into the fully equipped kitchen and accents the Corian countertops and the butcher-block island with warming tray. Also on the main living level is the main master bedroom with a walk-in closet. The private bath includes a tiled shower, a soaking tub and double vanity with designer square sinks. A large screen porch with built-in benches, high quality rocking chairs is accessed via the kitchen and over looks the rear yard and private pool. The curved stair case leads to the second level and the observation deck. Level two has another master bedroom with en suite bath plus 2 bedrooms with an adjoining bath. All the baths have decorative colored smooth edged square tile flooring. On the lower level of this exquisite home you will find the 5th bedroom, a hall bathroom and a second living/game room with a wet bar, microwave and refrigerator. There is a slider that leads to the patio, hot tub and your private pool with large pool deck and low maintenance vinyl fencing. The home is located only 6 houses from the Hollowell beach access. This location would generate a high walkable rating for ocean access, shopping, restaurants and sporting activities such as hang gliding at Jockey's Ridge State Park. 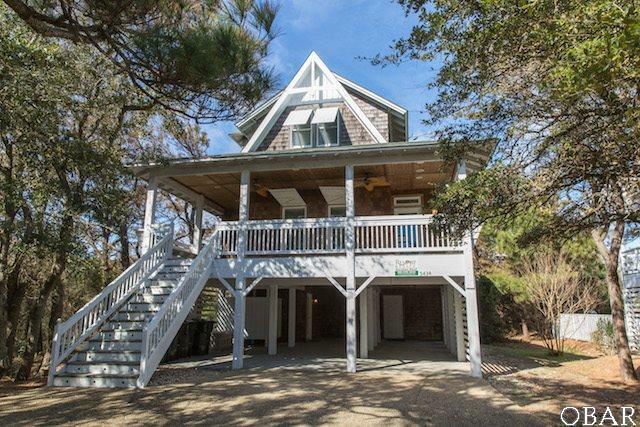 High Dune is a one-owner home that has been meticulously maintained. If your dream is to own a home at the beach, look no further. 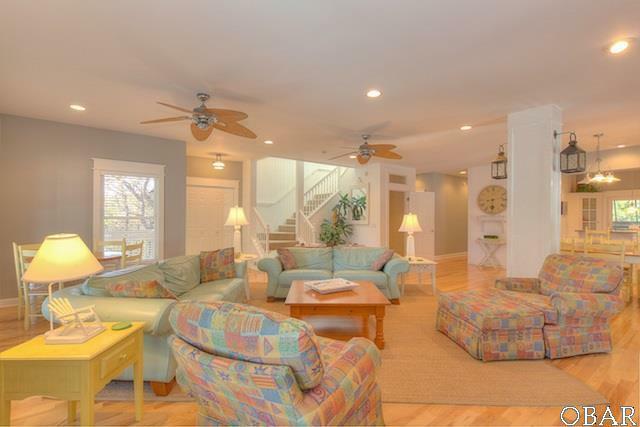 This home is perfect for year round living, a personal beach get-away or a vacation investment. Don't wait; schedule a showing today! Listing courtesy of Colleen Shriver of Century 21 Nachman Realty.